This is one of those stories about a technology invented and then forgotten. For example, when the Romans invented concrete and then another civilization reinvented it thousand years later. Well, it turns out that the skilled Damascus blacksmiths had produced blades containing carbon nanotubes at least 400 years before modern science began to understand their strength. Besides the beautiful decor and the impeccable construction, Damascus swords were famous for their strength, durability, and elasticity. They were the pride of the city of Damascus, Syria, which was a center for weapon manufacturing in the Near East, especially in the middle ages. The swords had their exceptional qualities mainly because of the so-called Damascus steel; a type of steel whose main ingredient was a wootz steel imported from India. A simple way to recognize a genuine Damascus blade is by its distinctive patterns of banding and mottling which resemble a flowing water. The term Damascus blade refers to both swords made in Damascus and for those that have the typical patterns yet were produced elsewhere. Today, there aren’t many original Damascus swords left in the world, besides the replicas which are made for tourists. Those that remain are either in museums or private collections. The reason for this is simple. Most of the master blacksmiths from Damascus took the secret of the original method in their graves. Although modern day blacksmiths have made attempts to produce the same grade of steel, the results haven’t been entirely successful. The raw materials, as well as the techniques, are different from those used by the old masters. Through the ages, Damascus swords have become legendary. Many stories speak of their tremendous strength, sharpness, and flexibility. One such story talks about a meeting between Richard the Lion-Hearted and Saladin. Richard wanted to impress Saladin by cutting a thick iron bar with his broadsword. Saladin was not impressed, he took his Damascus saber, threw a silk pillow and sliced it into small pieces before it fell to the ground. Another legend says that a Damascene blade was so flexible that a warrior could take the hilt in one hand, the blade in the other and bend the whole sword around his body. Then, after he released it, the sword would return to its original shape. In some other tales, a Damascus blade could cut a rifle barrel or a falling hair. Although many of those stories could be just myths, there is something remarkable in these swords. A group of German researchers analyzed an old Damascus blade in 2006 and found nanowires and carbon nanotubes in its molecular structure. It is still unclear how did the ancient craftsmen manage to create the nanotubes inside the steel, but scientists have offered a few theories. It is possible that the process of nanotube making is connected with the traces of vanadium, chromium, manganese, cobalt and nickel found in the wootz steel. During the thermal cycling of the wootz steel (hot and cold phases) in the process of creating Damascus steel, the trace elements got separated into planes. Later, those planes acted as catalysts in the process of carbon nanotubes creation. Nanotubes (and nanowires) formed along the planes of impurities, thus giving Damascus steel its trademark, the wavy bands, called damask patterns. 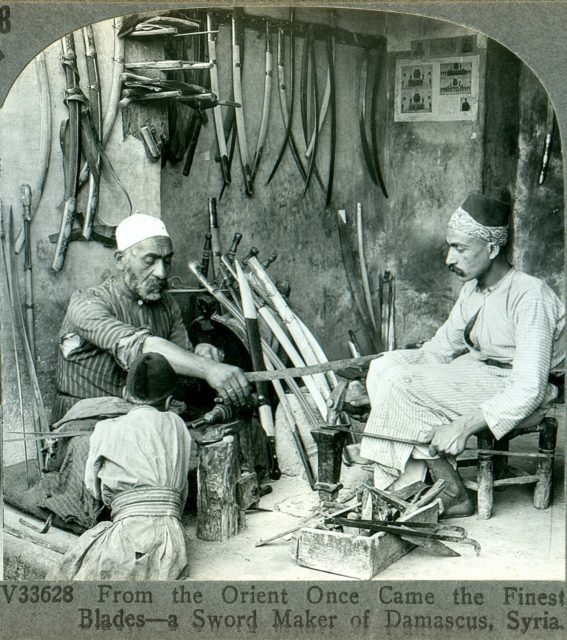 Damascus blacksmiths were maybe unaware about the chemical processes which provided strength to their blades, but still, they had been using nanotechnology long before it became known to science. Modern steel alloys are presumably better than the Damascus steel, but the blades which were made centuries ago were definitely ahead of their time. Most of the wootz steel used for Damascus blades was imported from India and Sri Lanka. It has been archaeologically proven that the so-called crucible steel process (melting iron and other materials) was first used in modern-day Tamil Nadu state, India, sometime before the Common era. India began exporting wootz steel ingots to Damascus and the Middle East around the 3rd century. This trade lasted until the 17th century when the export of wootz steel from India started to decline gradually. Sometime around 1750, the production of Damascus swords reached its minimum. Now, instead of blacksmiths, metalsmiths started to take over the business. This decline in steel import and the discontinuation of Damascus blades production probably happened due to the many technical and political reasons. One of the main reasons was probably the breakdown of the old trade routes which were used for supplying steel from India. Also, the British Raj in India started to suppress the steel industry in the country which led to the loss of this ancient technical marvel. The Indian wootz steel contained the much-needed trace impurities such as vanadium, chromium, manganese, cobalt and nickel. It is possible that the new, raw material imported by the Damascus sword makers didn’t contain these impurities, so consequently, the blades didn’t contain nanotubes. This, together with the forgotten techniques of thermal cycling might have prevented the same qualities and patterns in Damascus blades produced after the 17th century. 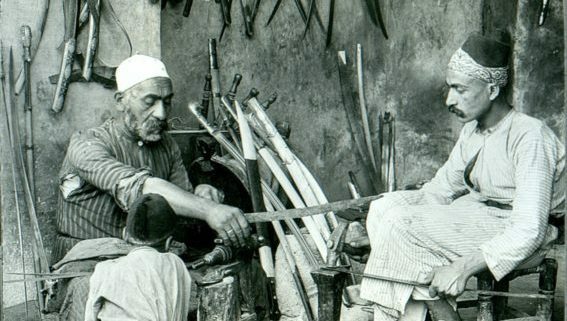 Many of the old Damascus blacksmith masters had kept their techniques secret and weren’t too keen on sharing it, so, understandably, the techniques were buried along with their masters.